Terry has been taking horse riding lessons. 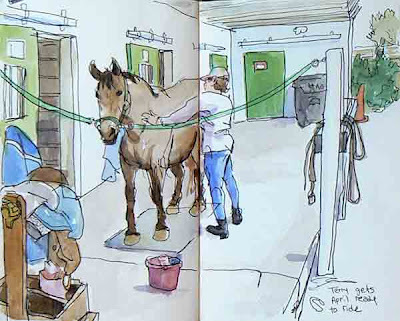 I go with her each weekend so I can sketch the horses. The Letisma Stables are on a large plot of land with many fenced off pastures. It is a nice break to get out and sit in the shade of a tree and observe the horses at work and play. I work part time at Full Sail as a Studio Artiste'. This means I help out in the lab as students are working on animation assignments. I like that this gets me out of my studio to meet young enthusiastic students just discovering this amazing medium. Here is a typical view of the Full Sail students at work doing traditional animation. On the left are the work tables with disks where the animation drawings are produced. 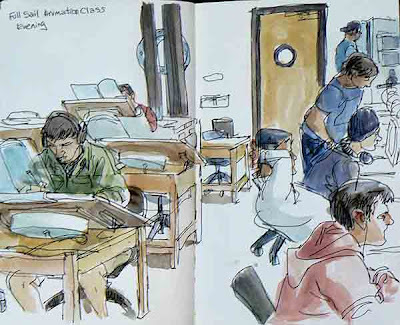 On the right students are sitting at stations where they shoot the drawings which are then digitized and played back in sequence on computers. This allows the students to quickly see the animation play at 24 frames per second. 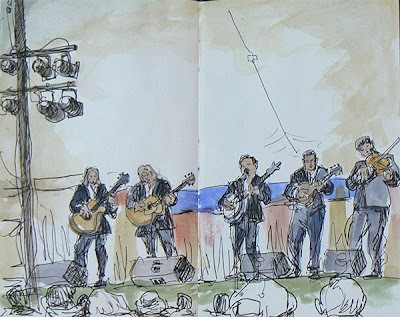 This is the only sketch I did of Bluegrass Performers. By this time I was tired, cold, and the tablet had died. The lead singer of this group had on a loud jacket with roses sewn on so he looked like he belonged in a mariachi band rather than a bluegrass band. Terry and I had moved forward and sat in the lawn chairs left in place by people who had gone home. I imagine the people were planning to come back the next day to reclaim there prime seating. The tablet didn't come out until after the sunset. 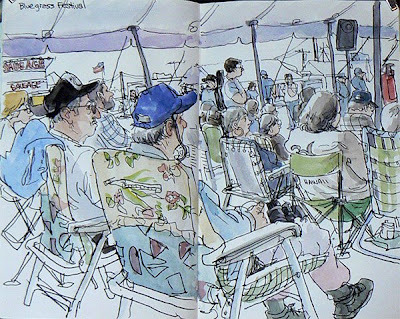 Terry and I had been sitting on the outskirts of the packed tent for most of the day. When the wind picked up and temperatures dropped, we were forced inside by workers who put up the side flaps to the tent. The couple in front of us fascinated me. The biker had a long grey beard that went down to his belly. The emblem on the jacket read: Christian Motorcyclists Association, with a bible in the middle of the logo. This groups vision , according to there website is: Changing the world, one heart at a time. 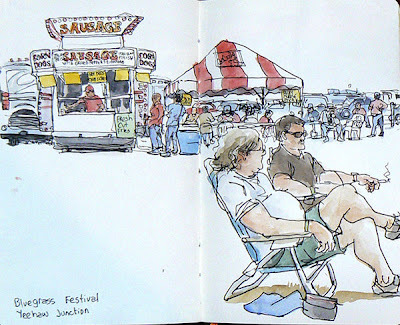 Later when I got a Polish Sausage, I saw the couple in the picnic area and she was lovingly brushing his long beard. Working with the tablet in the cold temperature had its advantages, like keeping my hand and lap warm as the computer chip heated up. As the sun set people began to bundle up. In the background you can see the septic truck which cleaned out the portopotties. Outside the staging area there were hundreds of RV's. 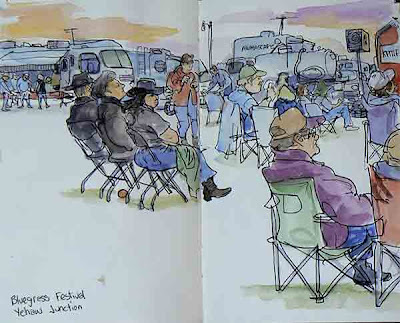 Besides the acts on stage, people were jamming all day and night in tents and RV's. 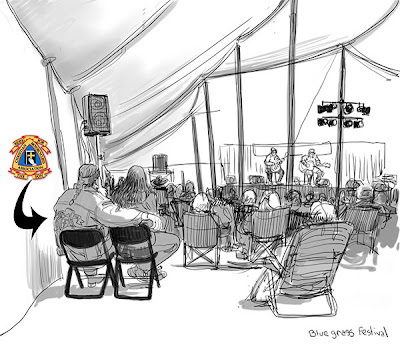 This morning I woke up with a nasty cold and I have no doubt that it is from sitting outside at this Bluegrass festival till 9:30 at night while I could see my own breath. I am not sure what the temperature was but it was cold! Yesterday Terry and I drove down to Yeehaw Junction (that is the real town name, honest) and we spent the day listening to Bluegrass bands. The music went on all day until 9:30 at night. Once the sun set, the temperatures plummeted and you could see your breath. The drive south on a small country road was enlightening. There were miles and miles of nothing but flat grazing land for cattle and horses. Terry is almost finished reading Tolstoy's "War and Peace". She says it is a very modern novel. When Tolstoy discusses the waste and futility of war or the quirks of socialites he could very well be discussing people and events of today. Zorro our cockatoo is perched on Terry's shoulder. I decided to go to the small house where Jack Kerouac wrote "The Dharma Bums", he was living here when "On the Road" was published and became an instant classic. Kerouac was compared by some critics to Ernest Hemingway. Where Heminway was the voice of the "Lost Generation", Keroac was the voice of the "Beat Generation". The interior of the house has been renovated to its 1950's state. I saw one of Keroacs manuscripts once at the History Center. The entire book was written on one large scroll so Keroac never had to interrupt his thoughts by replacing paper in the typewriter. The writing poured out of him as one long stream of consciousness. The home is now a refuge to young authors who apply for a grant to write there. 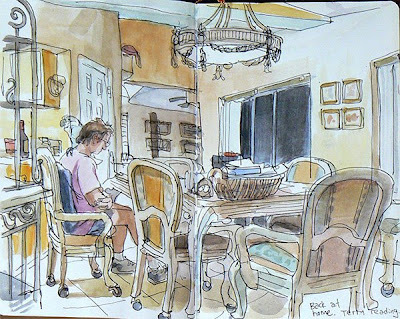 The Writers in Residence Project sponsors four different writers who live in the home each year rent and utility free. While I sketched a young man came out and sat on the porch and called his dad to tell him how things were going in Orlando. 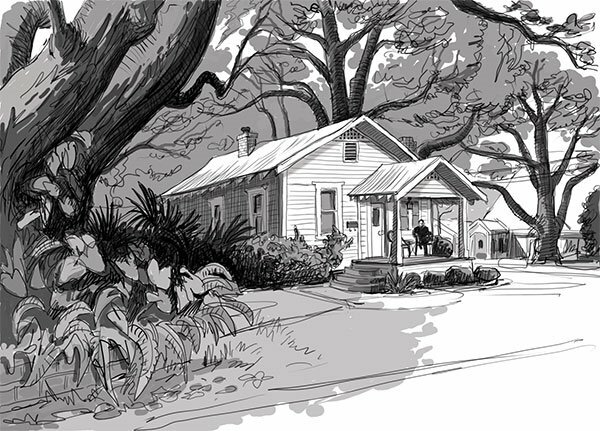 Post Script: I have recently discovered that the young man on the porch was resident artist Michael Hawley. 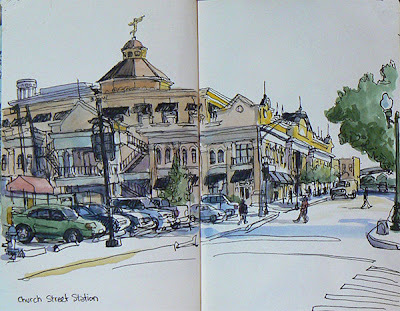 My ongoing fascination with Church Street Station has to do with its gradual decline in the last 10 years. The property has undergone foreclosure procedures and is now in the hands of the bank that lent Cameron Kuhn $34 million dollars to buy the property in 2007. A court date for a public auction will probably be set in 60 days from today. If no one bids, Tremont Realty will become the owner of the 260,000 square foot facility. Sadly my automotive woes continue. After returning from a relaxing weekend away, my truck started flashing its bright yellow "Service Engine Soon" warning light. I also found the gears would lurch into place causing a rather bumpy ride. So the truck went back to Zembower's for another checkup. Sigh. 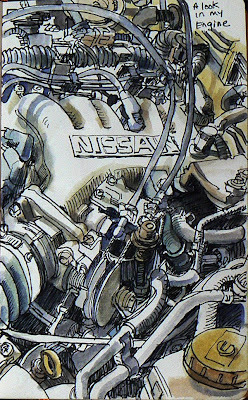 I must say that the mechanic resolved the problem in less time than it took me to do a sketch. A sensor was loose and since they did dismantle that area to do the previous work, I was not charged today. Zembower's has definitely earned my full trust. Since I was not invited to attend the inauguration in Washington DC, I decided to honor Obama by sketching the old Well's Built Hotel. Built in 1926 this building provided lodging to African Americans during segregation when rooms were not otherwise available. Today the building is a Museum of African American History and Culture. The building was strangely deserted, perhaps folks were at an inauguration party in another part of town. "I think it's important for people to just sit still and look out at nothing. I mean, always having buildings and condos and skyscrapers blocking your line of sight, its not healthy." 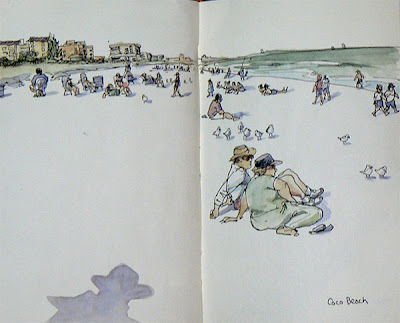 From Remembering Blue by Connie May Fowler. We got to the coast in the late afternoon. I drew the view with the tablet. In the evening a Delta rocket was to launch. We waited on the beach for an hour but the countdown was delayed because of a glitch. We gave up and went out for sushi. Just as we finished eating, we heard and felt a loud roar. Everyone including the chefs ran outside to see the huge orange trail rise into space. Built in 1927 the "Million Dollar Courthouse" is a fine example of Beaux Arts architecture. The building was designed by architect Murry S. King. Today the Orange County Regional History Center is located in the building. An exhibit of Jim Henson's Muppets is now on display. While working on this sketch I kept getting bombarded by acorn shards from a squirrel that was sitting on a branch about 10 feet above me. I shouted up to him to cut it out but he just kept munching away. I finally had to accept the fallout in order to complete the sketch. A yellow smudge in the upper right hand corner is from particularly gross half eaten bit of acorn. Today I searched the web for images from Andrew Wyeth figuring I could learn something from his loose high contrast watercolors. As it turns out Andrew Wyeth died yesterday at the age of 91. He seems to have been producing art right up until his final days. He will be missed. Today is the final day in my 3 day oil change saga. I picked up my truck at Zembower's Auto Repair and I find that it only cost $500 to do the repairs. That saved me $3000. The folks at Zembower's now have a loyal costumer. Driving back from the shop I decided to go downtown and sketch on top of a parking garage that is overlooking a construction site. A photographer from channel 13 news also was taking in the view. He is composting a number of shots together to get a panoramic photo. 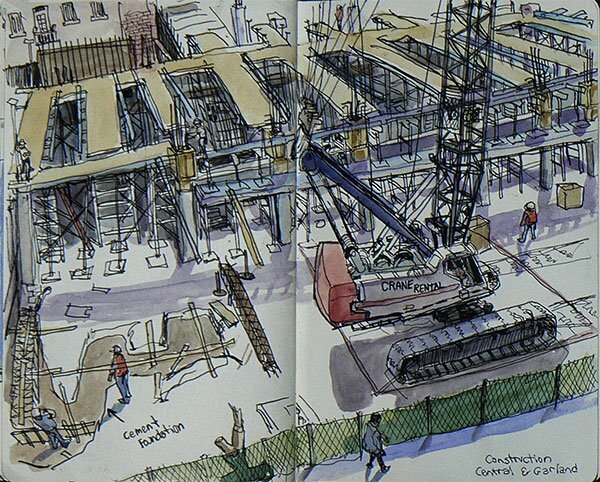 For me this may be the start of a construction time lapse series of sketches. With an auto repair that will cost over $3,000 I decided to take a look under my hood to see if I could spot any problems. The only item I have ever touched is the oil dipstick in the lower left corner. All the other wires, tubes, nuts, clamps and hoses are a mystery. I figured if I could see the problem then I should be able to fix it with some Duck Tape. To me everything looks in order. I decided to go in to my Nissan dealership today for a long overdo oil change. The waiting room area had a window that overlooked the actual work space. Donovan sat reading a good book and another costumer surfed the web with a laptop. It turned out that my truck has a few leaks and the grand total for the repairs would be $3,500! I called my wife and she suggested I go to her mechanic for a second opinion. That second mechanic claimed he would do the work for 10% less than my dealership. When I got to this second mechanics shop however I find that he has a backlog of work and at the least the repair would take 2 days. That means I would have to pay to rent a car for 2 days. I came back to the studio with just the oil changed and now I need to decide what to do next. 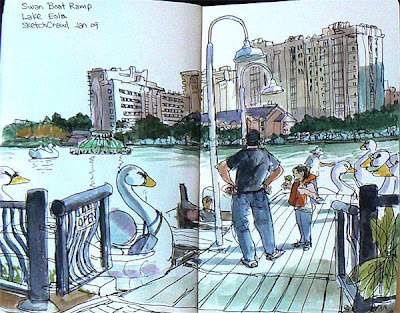 I wandered over to International Drive again to give the tablet another try. This pirate ship is one block East of International on Canada Avenue. As I walked towards the theater I saw 2 pirates on the street corner trying to entice tourists to get tickets. I thought, what luck I get to draw some pirates today. Unfortunately they turned on there heels and headed for the stage door before I had a chance to put a single line down on the tablet. 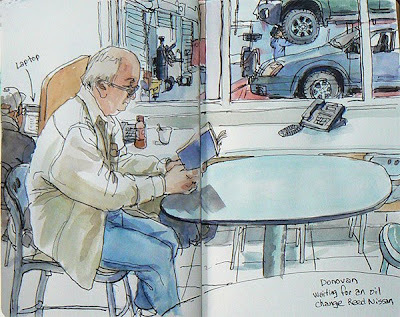 As I was sketching a young British tourist who was lost asked me if I knew where Walgreen's was. I didn't have a clue. 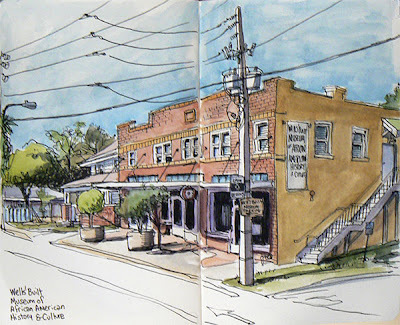 This is the last sketch from Saturdays Sketch Crawl. 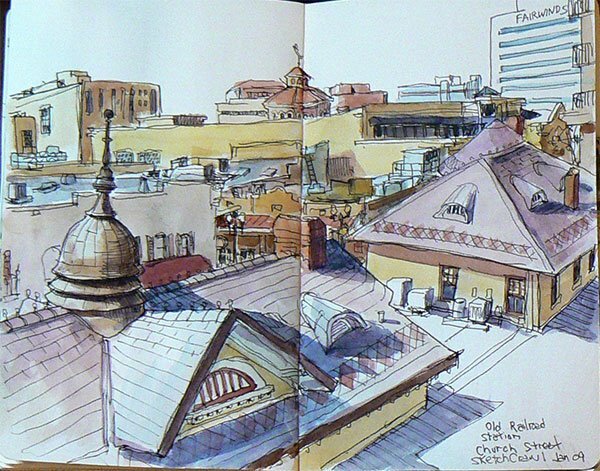 This was done from a parking garage overlooking Church Street Station. 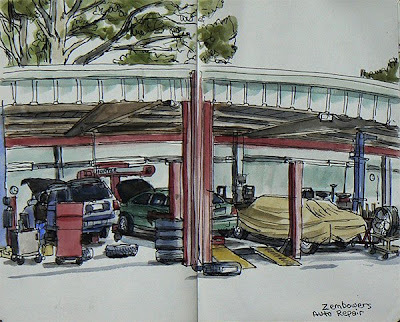 While doing this sketch I noticed a black purse on the railing of the garage. Inside the purse was a small zebra stripped wallet with a drivers license and a credit card. Rather than trust the garage weekend guard I figured I would return the items myself. I tried to find the person online and in a phone book with no luck, but of course the license has an address so I will mail it off. I considered driving to save postage but the place is like 50 miles over by Tampa. So today I will take a trip to the post office. Although I did some sketches today of my wife's horse riding lesson, I will post another drawing from yesterdays sketch crawl. The little girl had an ice cream and soda. When the wife returned with some more food, the couple argued a bit. Dad didn't want to pay $12 to float around on some Swan. Gabi over at sketchcrawl.com said that this was his favorite crawl sketch, so it would be a shame to not post it here. 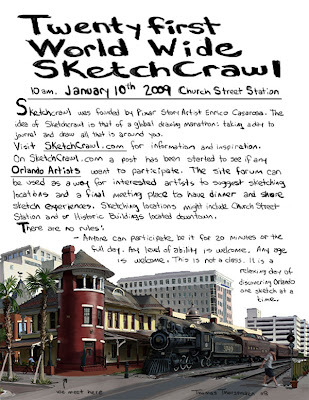 Well today was the Twenty First World Wide sketch Crawl and Orlando is participating for the first time. Two other artists showed up to meet me at Church Street Station Paul and Don. Paul did a sketch of the old Steam train at the Old Railroad Depot and apparently was constantly being asked for money by homeless. I tried my Tablet out but made the mistake of sitting in the small shadow of a street sign. Within a half an hour, I was fully in the sun and the battery gave out half way thru that sketch. I ended up loosing about a half hours work since the sketch reverted back to its last saved state. I then pulled out the old trusty pen and ink and got to work. I only did 3 sketches but I am pleased with the results. Today I will post the first which is of the Church Street Ballroom. 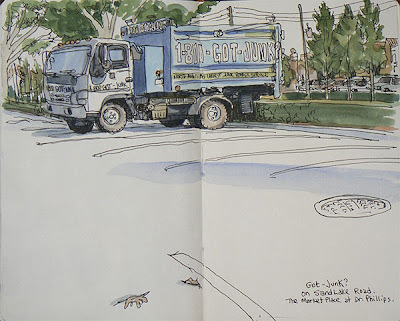 As I sketched the lawn keepers busily blew cut grass and leaves into the street. 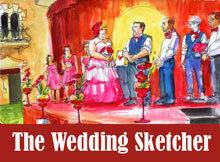 Only one day to go until the twenty first world wide sketch crawl. 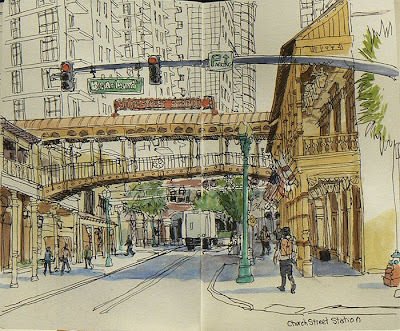 Orlando artists will meet at the Old Orlando Railroad Station at Church Street Station at 10am. I will be working with my tablet until the battery dies and then it is pen and paper for the rest of the day. 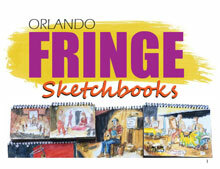 I am looking forward to a solid day of sketching and hopefully meeting some local artists. For anyone who. like me, does not like paying for parking, I tend to drive east through downtown until the suburban streets loose the parking meters. That adds some walk time to my trip but I can use the exercise. 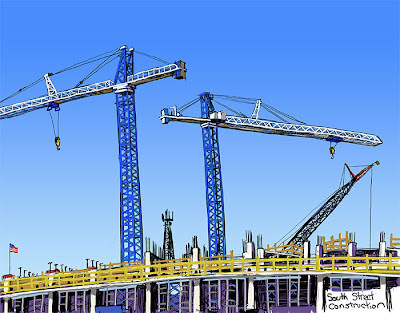 Like any boy who has played with an Erector set as a child, I am fascinated by construction sites. This building is going up on South Street and North Hughey Avenue. I used this location as my second test of the Motion Computing Tablet PC in the field. I have not been using the Tablet since it has always died within an hour using the standard battery. 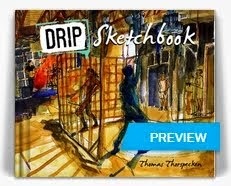 That means I have always had my sketch interrupted before it is complete. 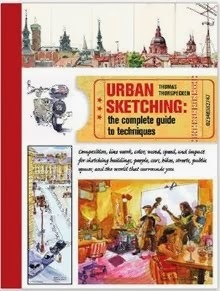 I just got a second battery and I could have up to 5 yours of sketching time now. I managed to crash the program Sketchbook Pro since I raised the resolution on this sketch from 100 dpi to 300 dpi. The program became sluggish and crashed when I tried to paint the sky. Rather than try a second time, I decided to paint the sky in when I got back home using Photoshop. I am pleased with the rich colors I get painting using the Tablet as opposed to the subtle effects of watercolor on paper. I am toying with the notion of doing a sort of time lapse series of sketches all done from the same site to show the buildings progress. I noticed a parking garage near another construction site and I may go to the roof of that garage to start the series. I am always surprised when I pass this construction site. With all the devastating financial news of the past months it amazes me that workers are still crawling all over this mega ritzy mall construction site. It seems that all new construction must come in Izod colors and look like it belongs in a Disney Theme park. I am finding this sketchbook is consistently making me feel cramped horizontally. 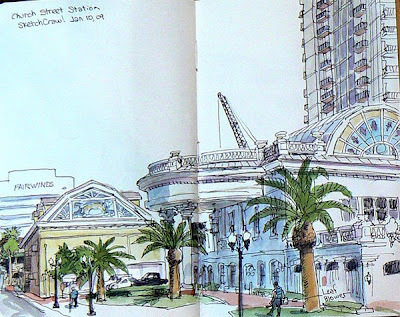 My last sketchbook had panoramic spreads. Well with this posting of one sketch a day, you get the good bad and the ugly. Today I wandered over to International drive. I Drive is only about 2 miles from my home but until now I avoided it like the plague. Tourist traffic during high season can be insane. Everyone driving on International drive is lost so defensive driving is always needed. 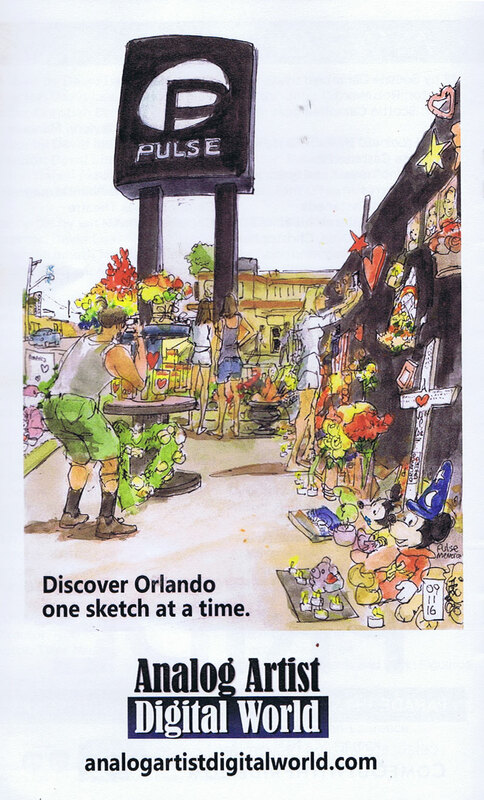 It seems ironic to me that many tourists who visit Orlando never see any part of Orlando besides International Drive and the Theme Parks. Today's sketch was pleasant to do since the weather was so nice. I misread the name of the hotel in the background it is actually the Enclave Hotel. I guess my eyeglasses are not up to snuff. As I finished this sketch the lights and background music began to turn on. 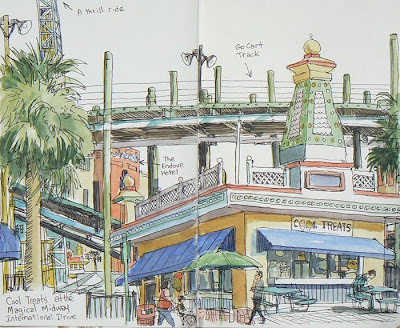 With this sketch I was sitting under the I-4 overpass looking East. To my right there was a small stash of clothes presumably from a homeless person. 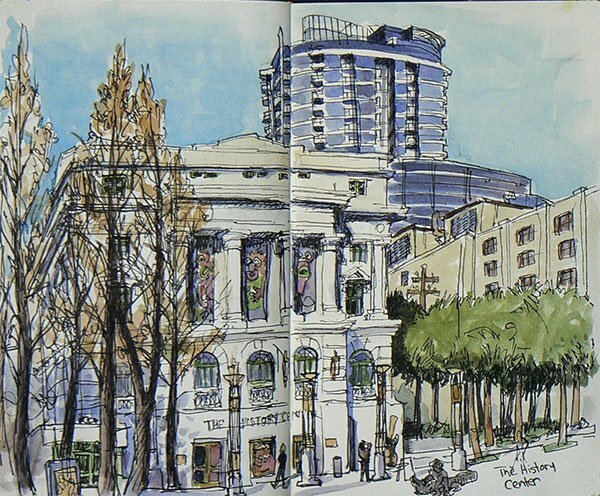 I did the sketch around noon and the foot traffic was light. Once in a while a truck would rumble onto Church Street to deliver produce and beer to the restaurant and pubs. 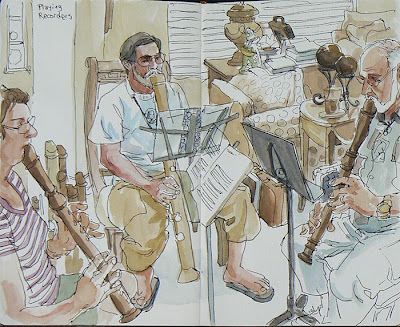 My wife Terry invited over Roger and John and they played Medieval Music all this afternoon. The music is sublime in its simplicity especially when they play the final note in harmony. It was nice to be right on top of the performers as they played. Today I was pleased to use my tablet PC as a way to show off the artwork I had created for a poster. It was very convenient to open Photoshop and then pass around the tablet so people could see the work up close. I did this sketch during that meeting. 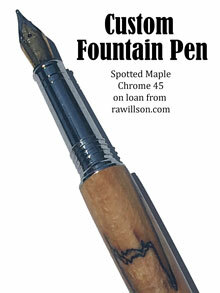 I found the pen slid around a bit to much for my taste, but perhaps in time I will adjust to that slippery tactile feel. I liked that I could keep adjusting the size of the page I was drawing on. I enlarged the width of the sketch several times. I also found that I tended to erase more often than I usually do. Today I will simply see if I can post today's drawing. You can see this truck any time you drive down Sand Lake Road. It must be parked permanently in this spot just as advertising. I have seen it at the same spot everyday for over a month. I cant help thinking any time I see it, "Yea I got Junk, I got junk in the trunk". This is a test to see if this blogging thing works. If you are reading this than you may have probably surfed back through many sketch entries. To start I should supply the 5 W's... Who, What, Where, When, and Why. WHO... My name is Thomas Thorspecken. WHAT... This is a place I will post daily sketches. WHERE... 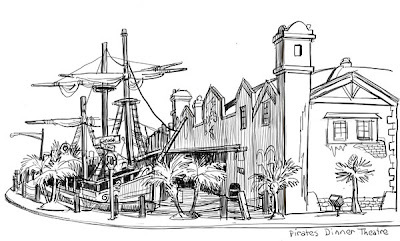 I find myself living in Orlando Florida after a 10 year stint of working with Walt Disney Feature Animation. Disney closed the studio since they feared that people would only go to films produced with a computer. These last few years I have been rediscovering my own artistic vision. I have been using the computer more and more in my daily work. I just bought a tablet PC, and I will be posting sketches produced with that as well as sketches done by traditional means of pen on paper. That way I should over time figure out which medium works best for the work I do on location. WHEN... there seems no better time to start then at the start of a new year. 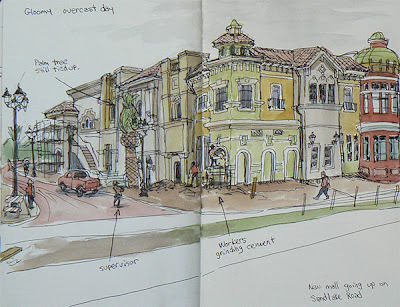 WHY... Of late I have become more and more fascinated with artists sketch blogs online. I have been lurking and learning from those artists entries. This blog then is my way to join that discussion and perhaps a visiting artist will learn from my mistakes and triumphs.